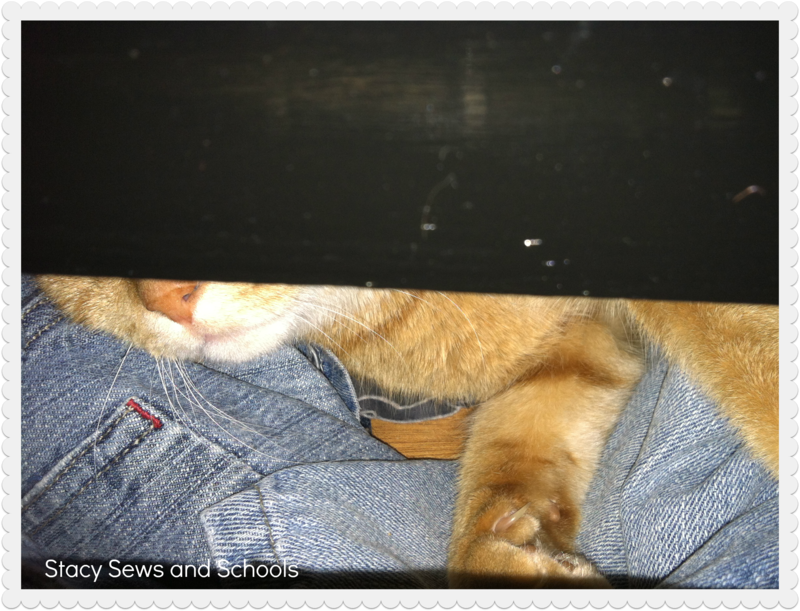 She was sleeping in c2’s shorts drawer! LOL I almost shut her in there! Take that first piece and use it as a guide to cut the back piece. 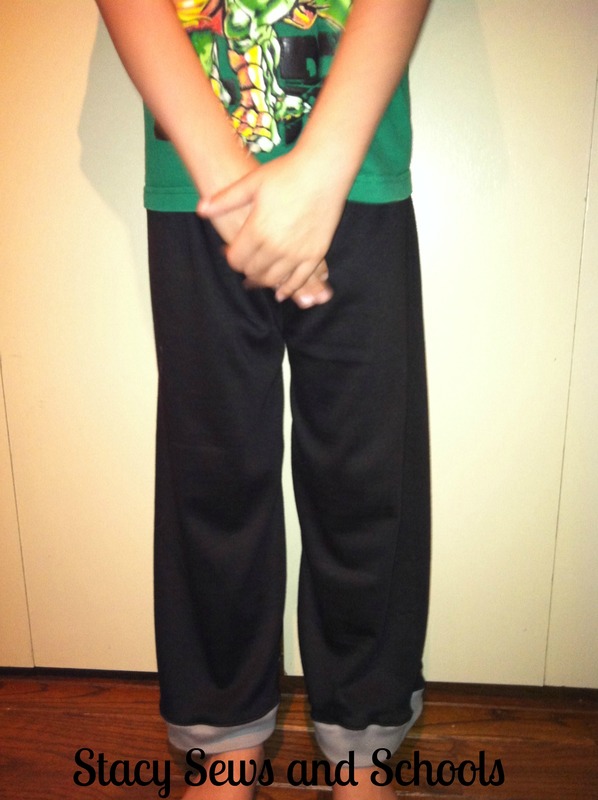 Take your child’s pants and lay them on the fold with the crotch pulled out all the way. 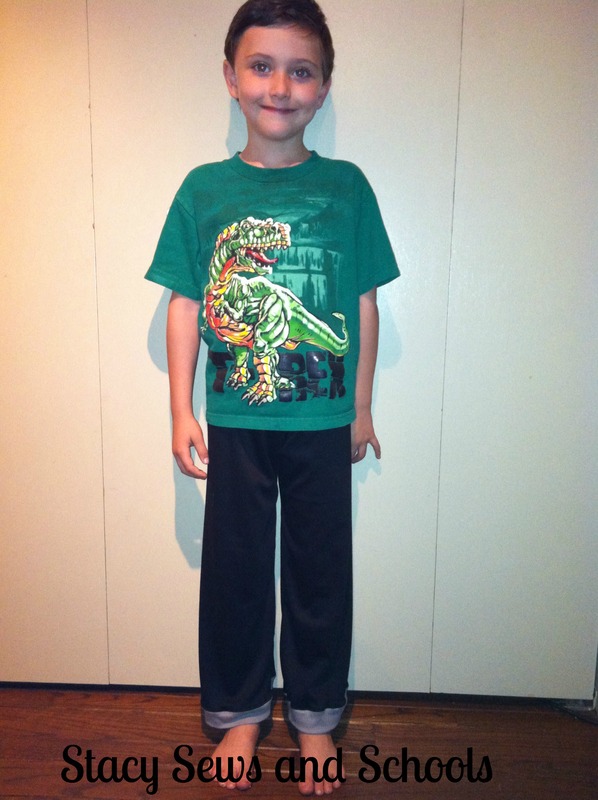 You will cut the pants leg using that as a guide. 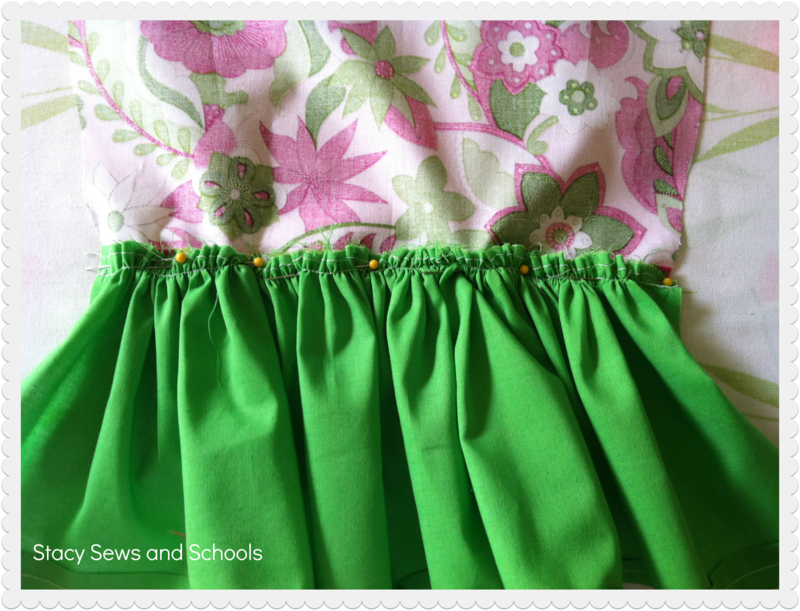 You will want to leave 1 1/2″ at the top for the elastic casing and cut the legs 6″ shorter to leave room for the ruffle. 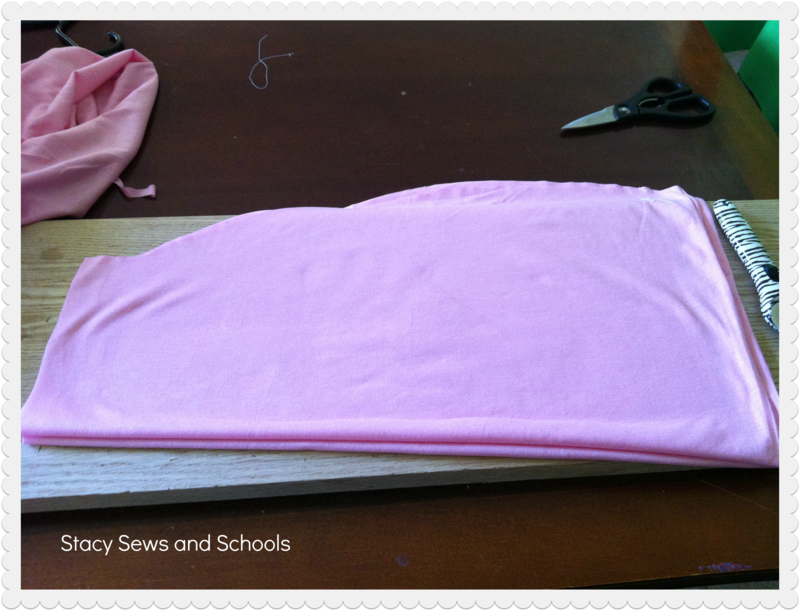 Flip your newly cut leg and place it on the fold using it as a guide for the 2nd leg. 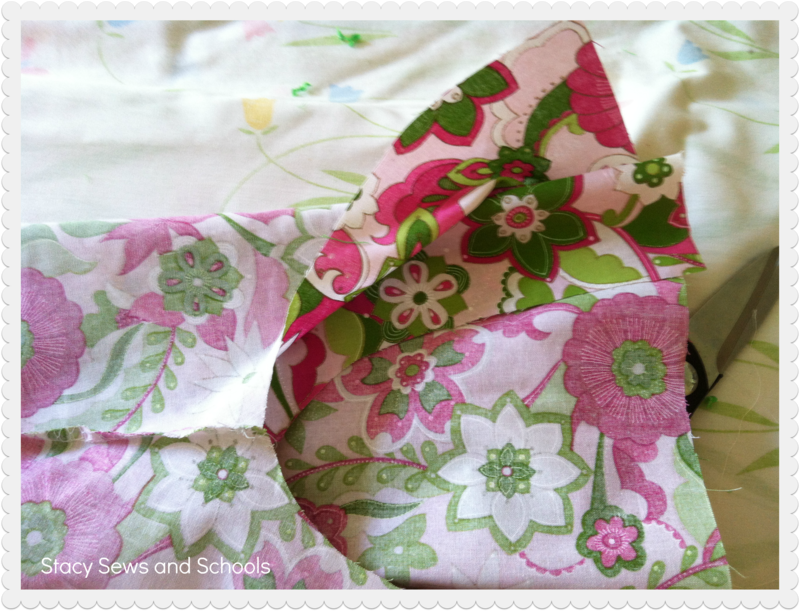 Cut 2 pieces for the ruffle 1 yard long (this way ——————- ) and 6″ in width. 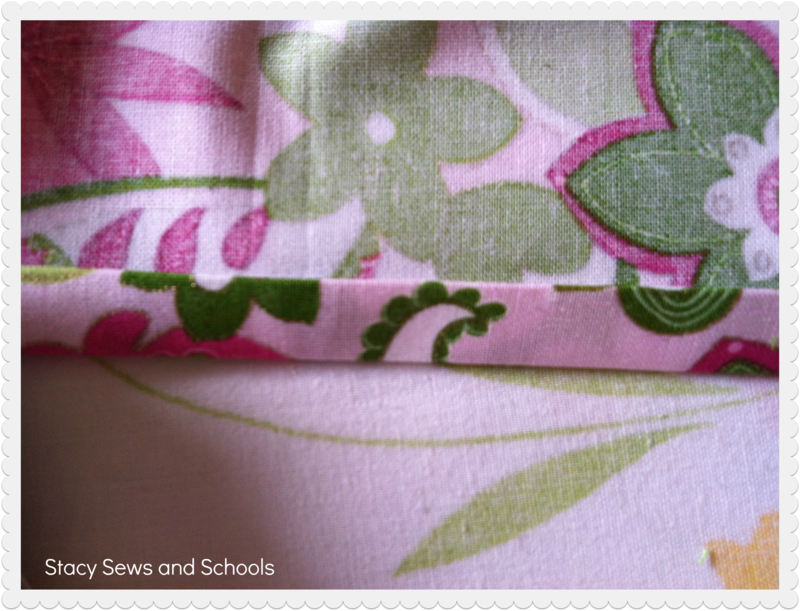 Fold over the top 3/4 ” and press. 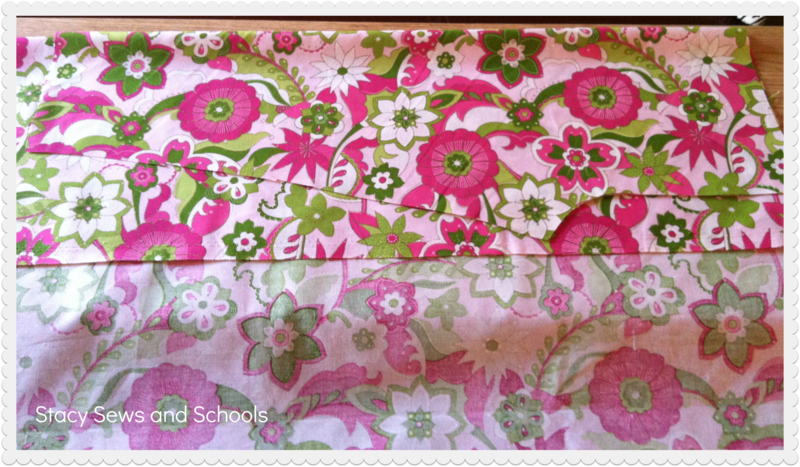 Fold over another 1″ and press. 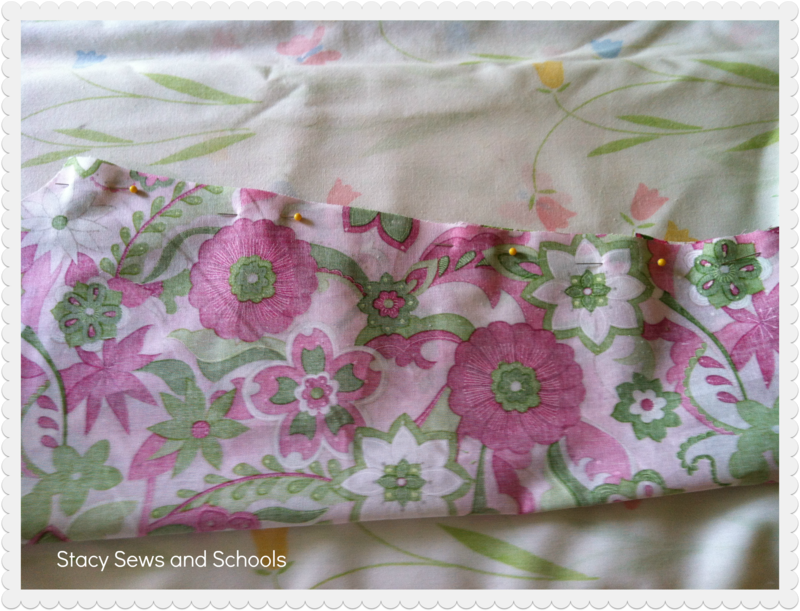 Now pin and sew the ribbon casing. Do that to the back piece as well. 🙂 Make sure to leave all the ends open! 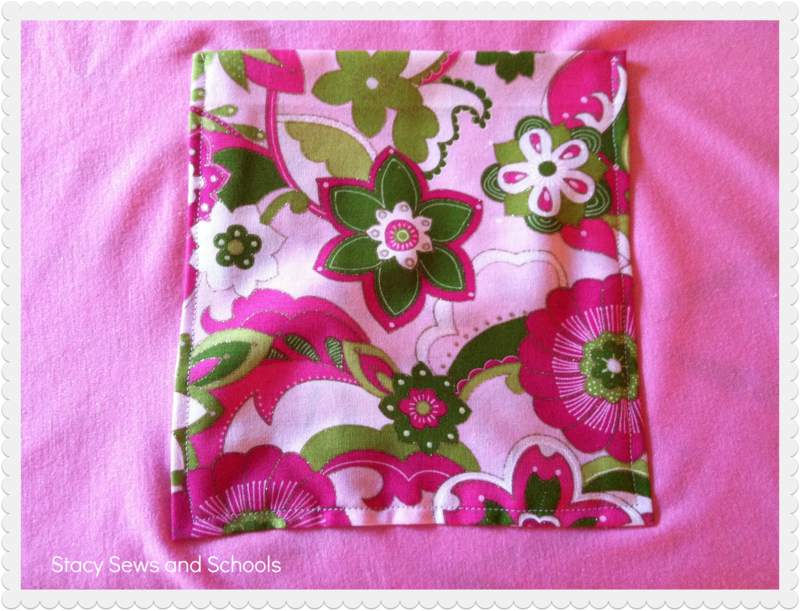 Fold over both edges of the top of the pocket by 1/2″ and press. 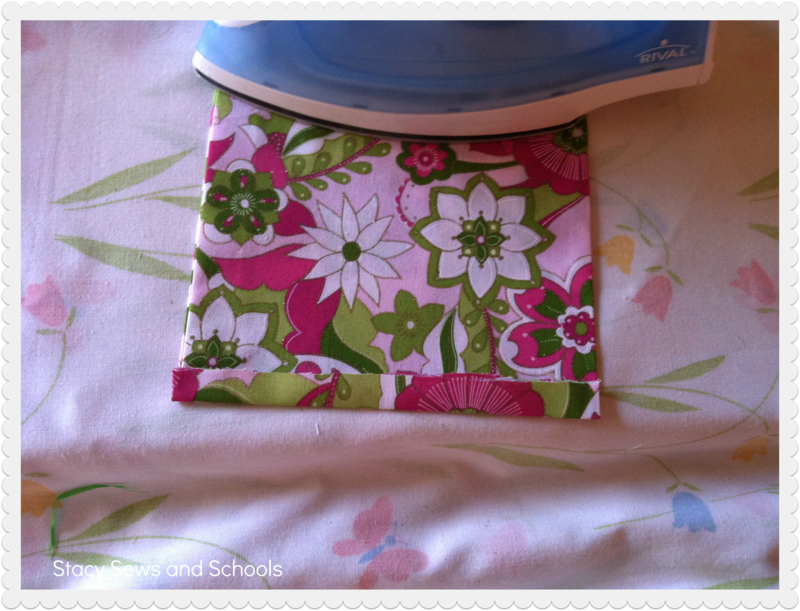 Now fold in the sides by 1/4″ and press. 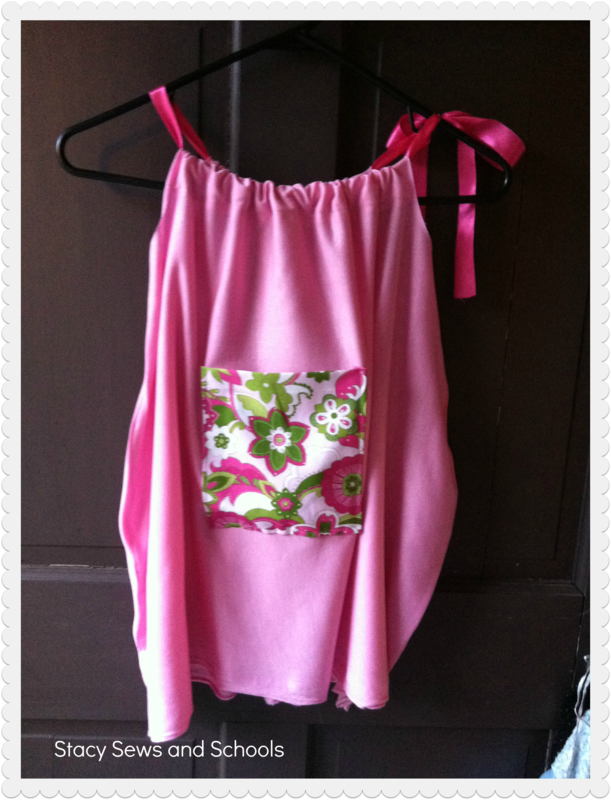 Pin the pocket to the front where you would like it to be. 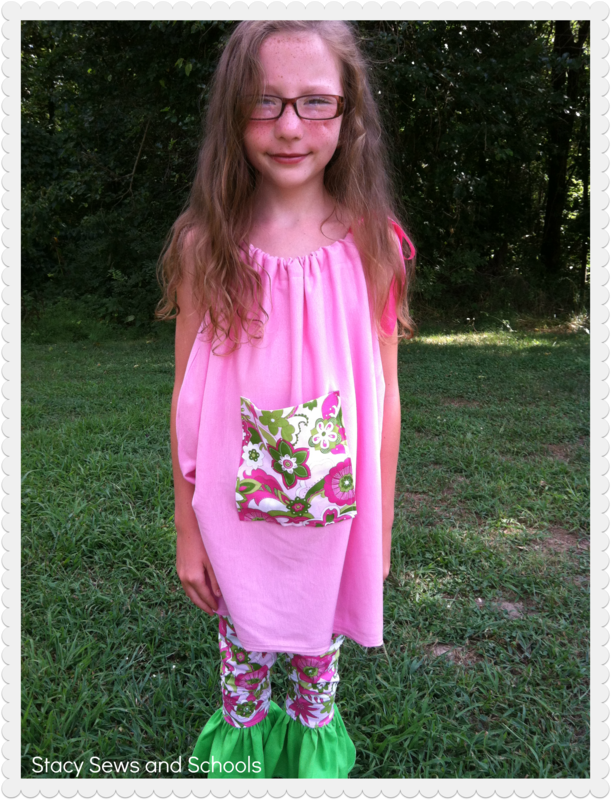 Sew it on with a straight stitch. 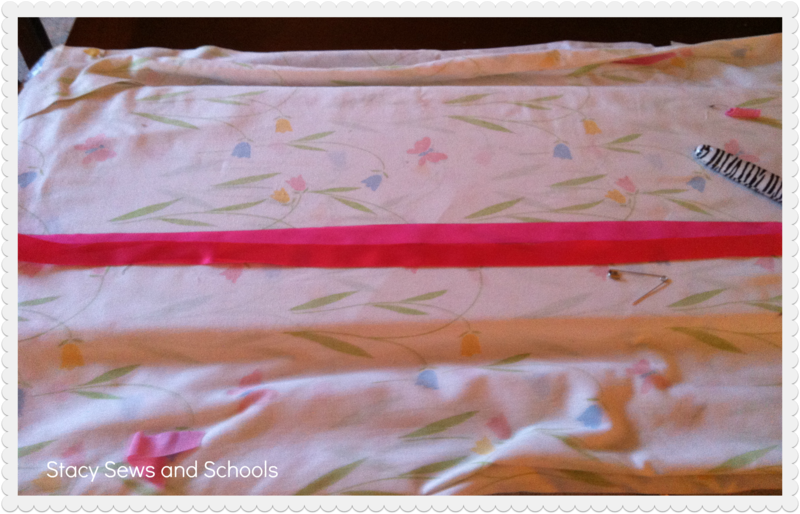 Cut your ribbon long enough to stick out 6″ of the casing front and back. 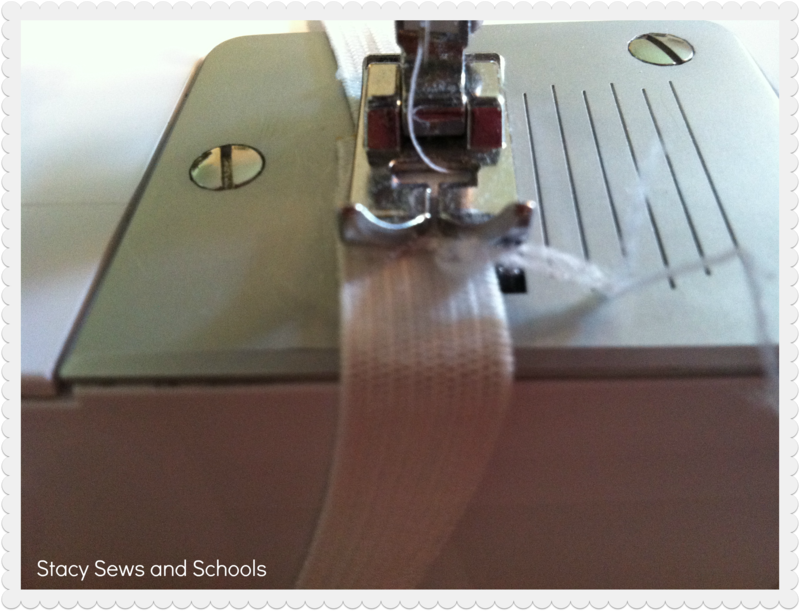 Safety pin the ribbon ends and push through the ribbon casings. 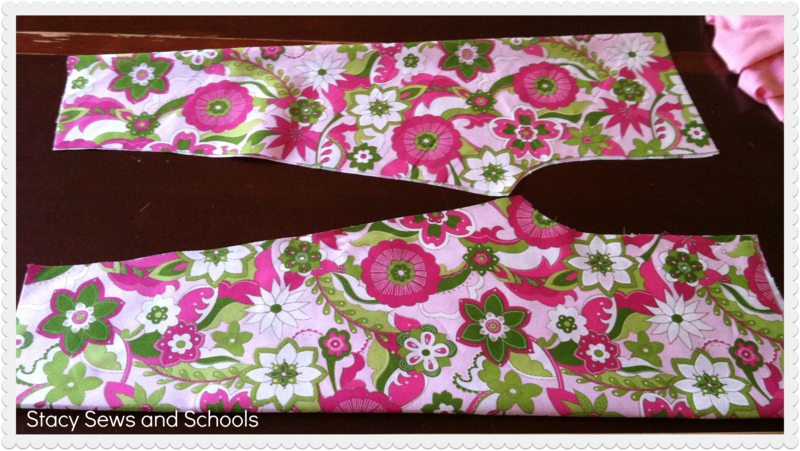 Tie it up in a pretty bow! Now, on to the bottom! 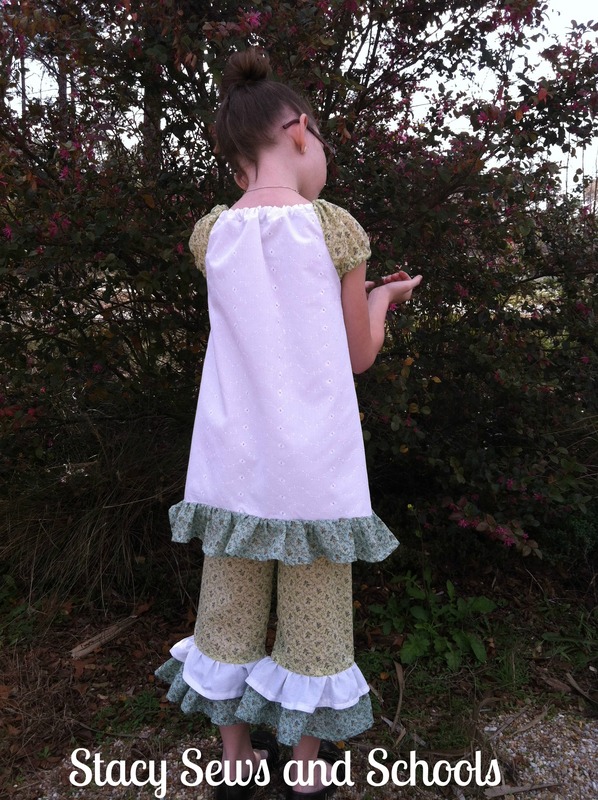 We are going to hem the ruffles for the first step. 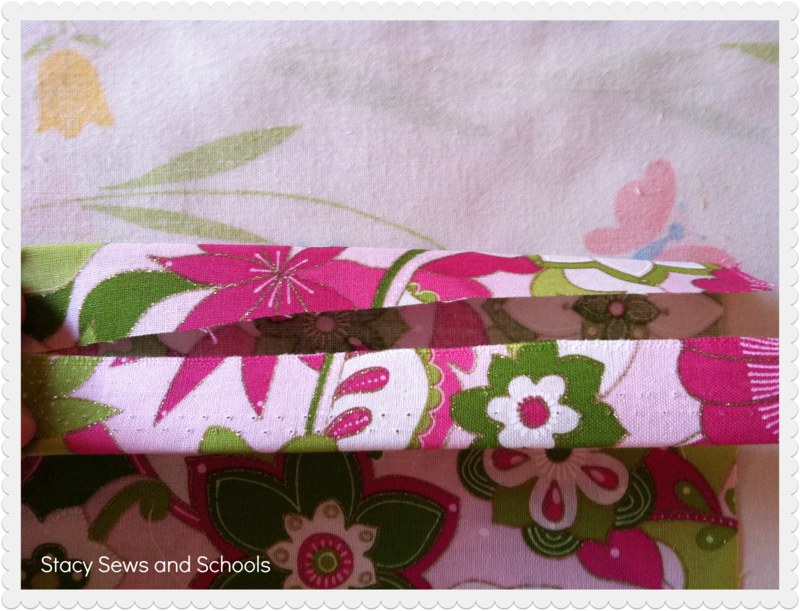 Fold over the edges 1/4″ and press. 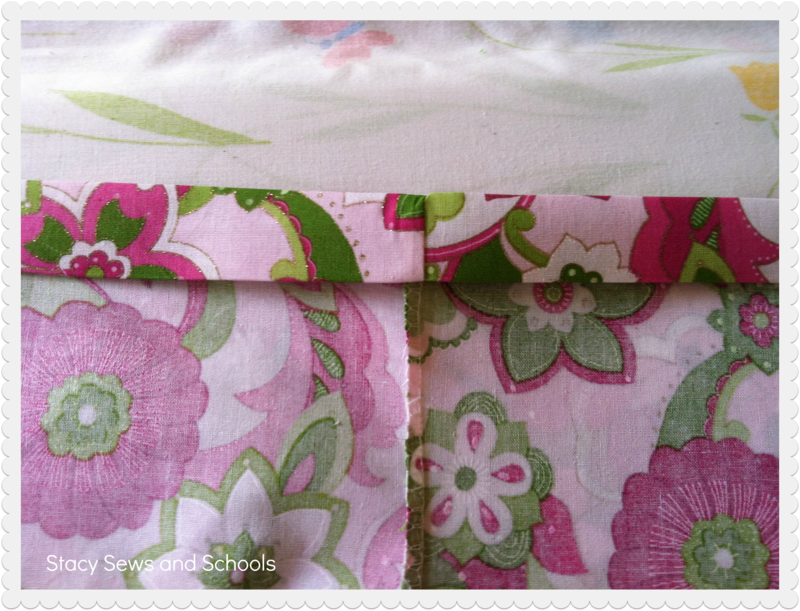 Fold over another 1/4″ and press. 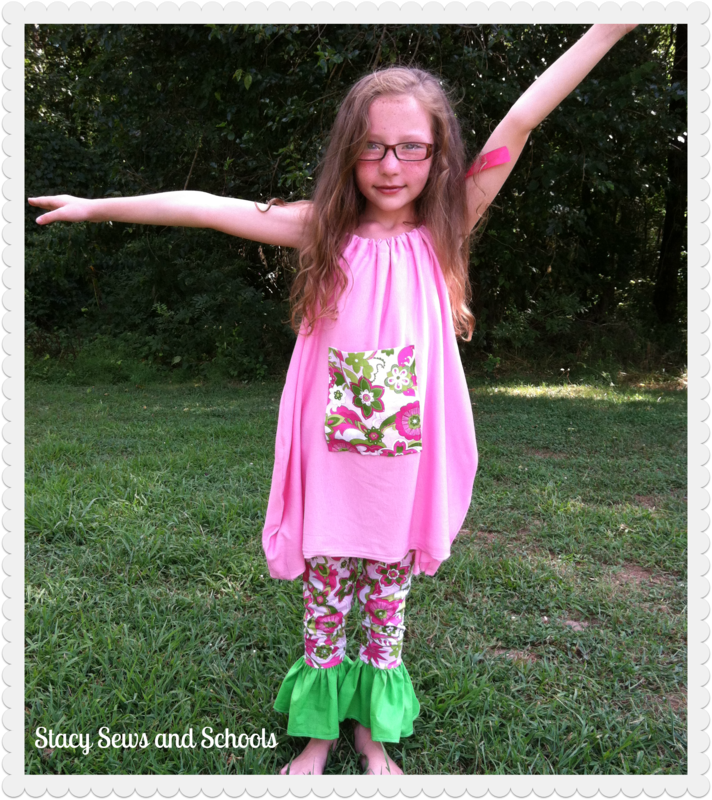 Now sew your hems. 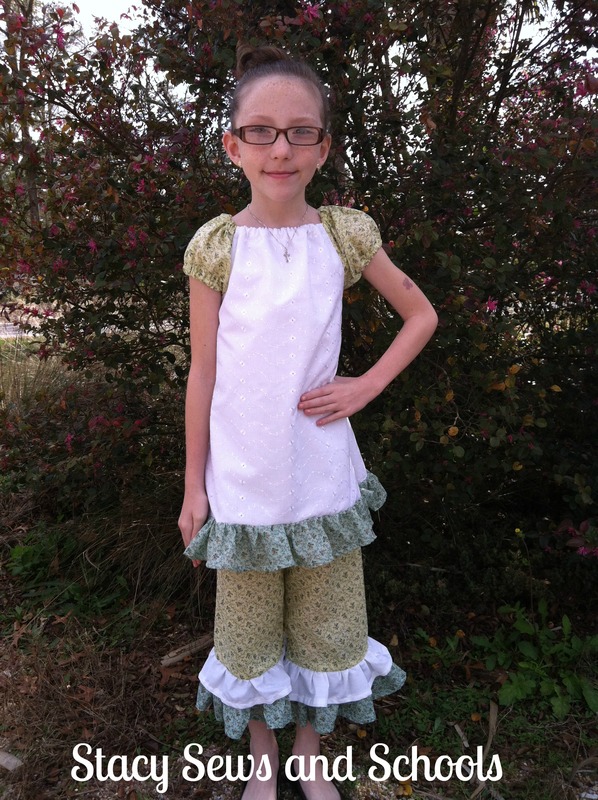 Sew a gathering stitch across the top of the ruffle pieces. 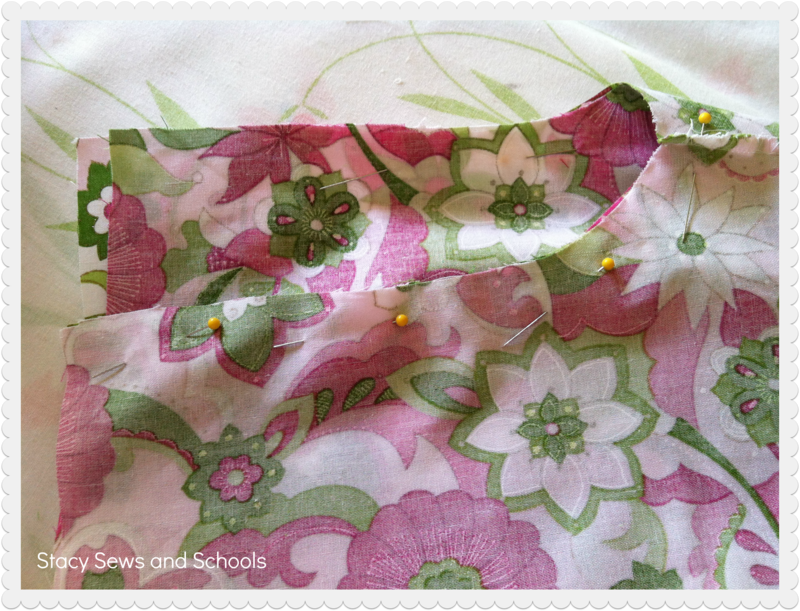 You should sew 2 lines on the top of each piece. 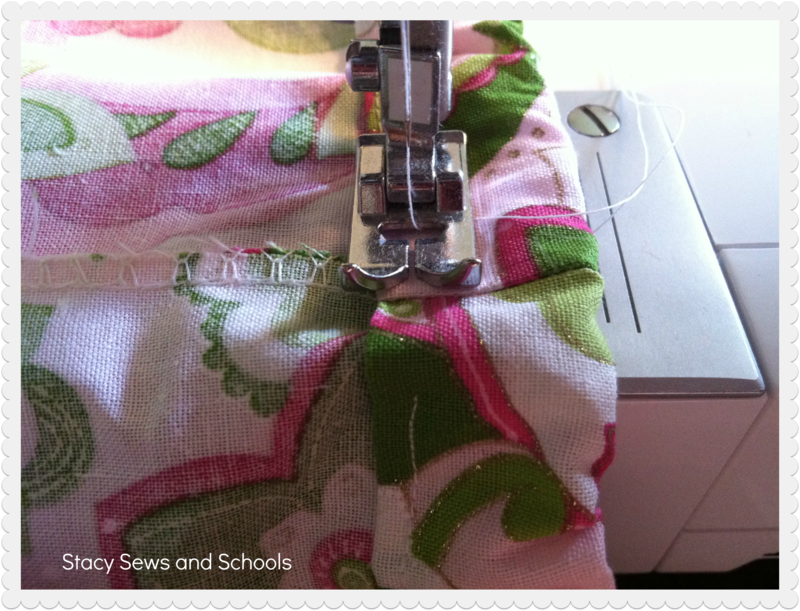 To sew a gathering stitch on my machine I set both stitch settings to the highest place. 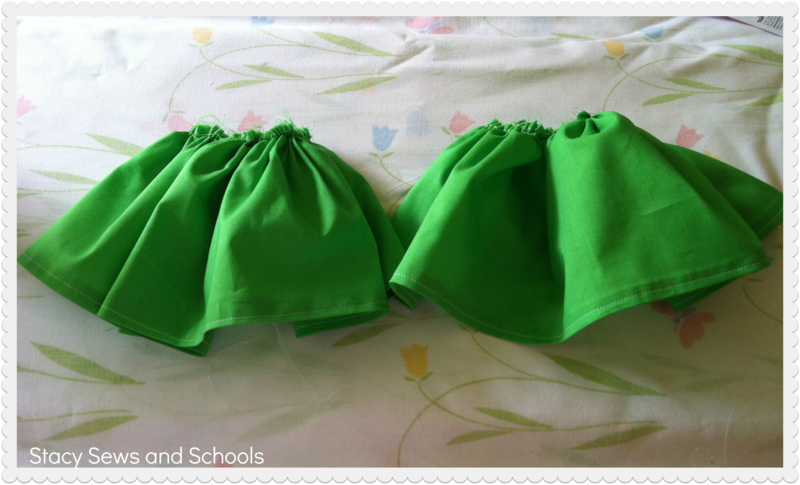 Fold up the bottoms of the pants legs 1/4″ and press. 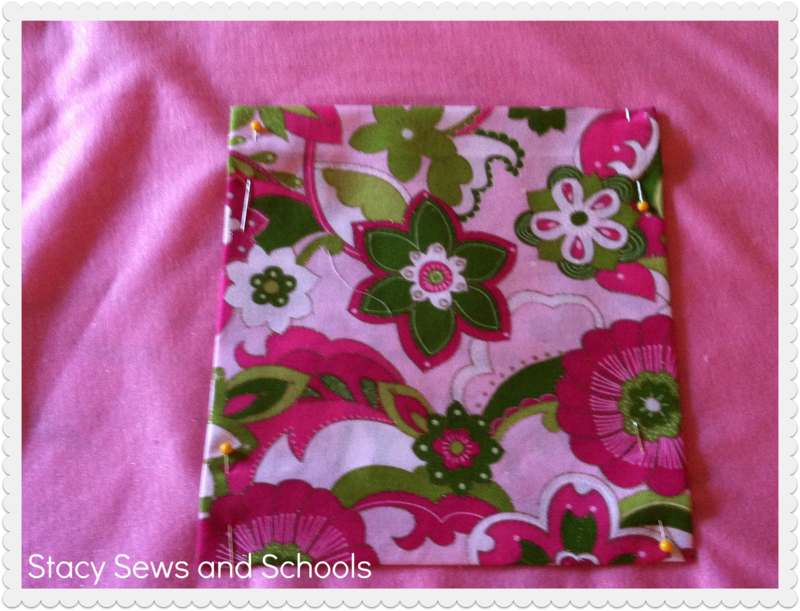 Fold up another 1/4″ and press. 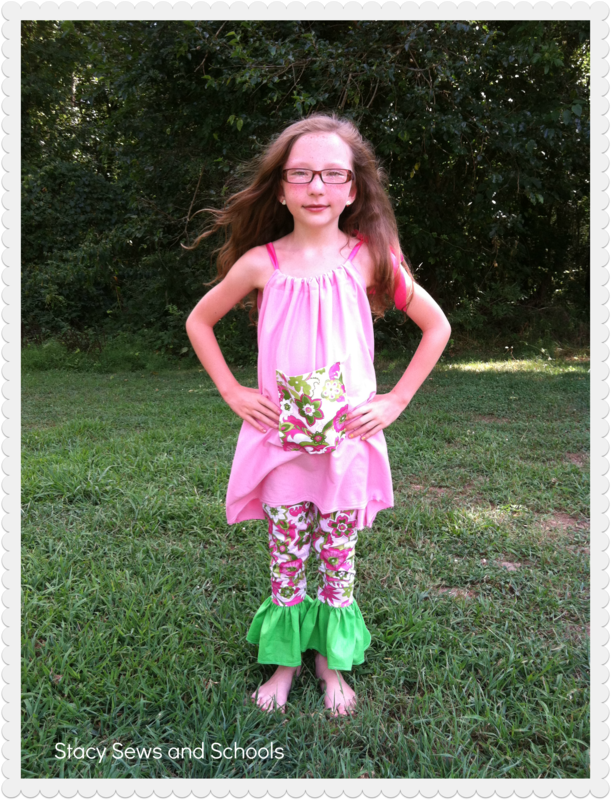 Pin the top of the ruffles to the bottom of the pants legs. 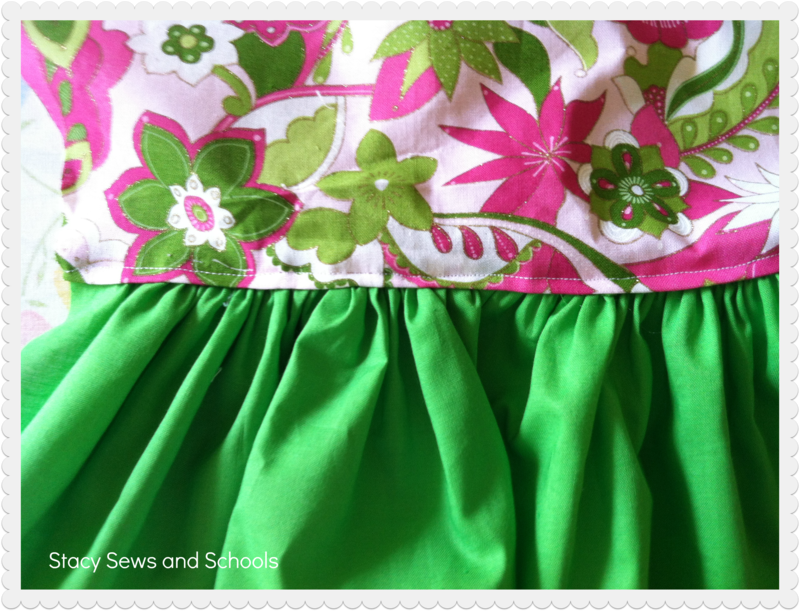 The right side of the ruffle will touch the wrong side of the legs. 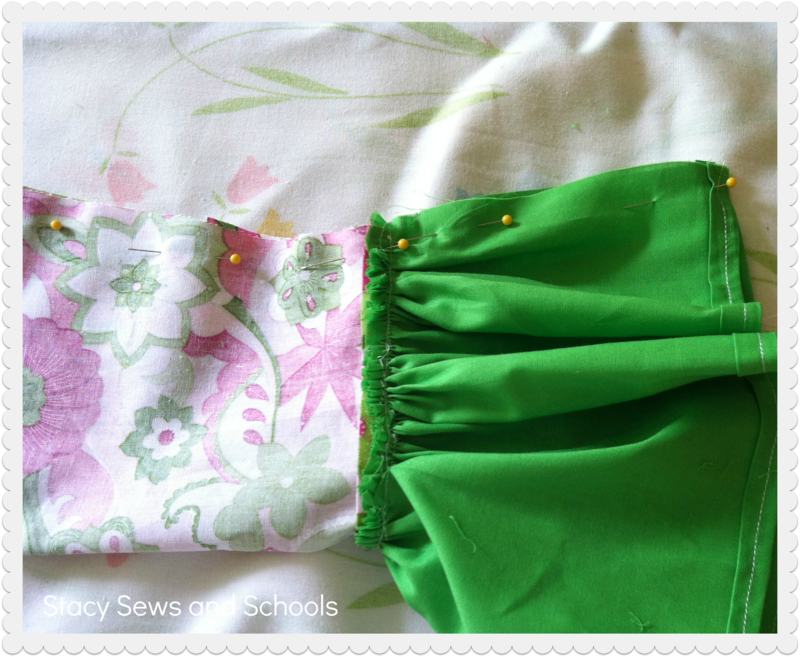 Sew the ruffles in place. 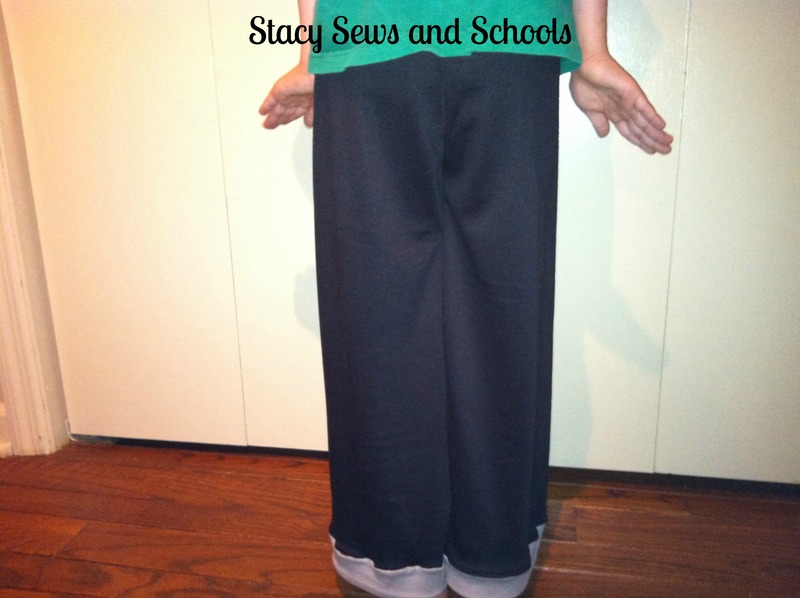 Pin up the sides of the pants from the crotch down to the bottom of the ruffle. 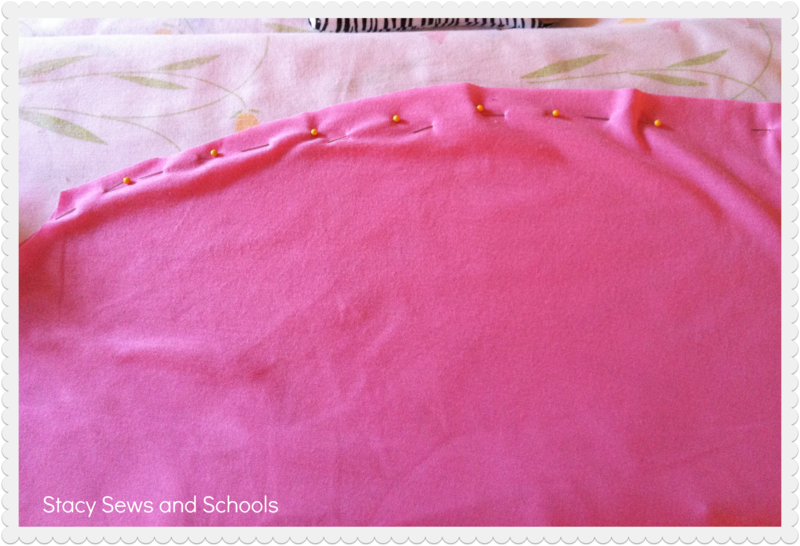 Turn one leg right side out and stuff it down the other leg, matching up the inseams. 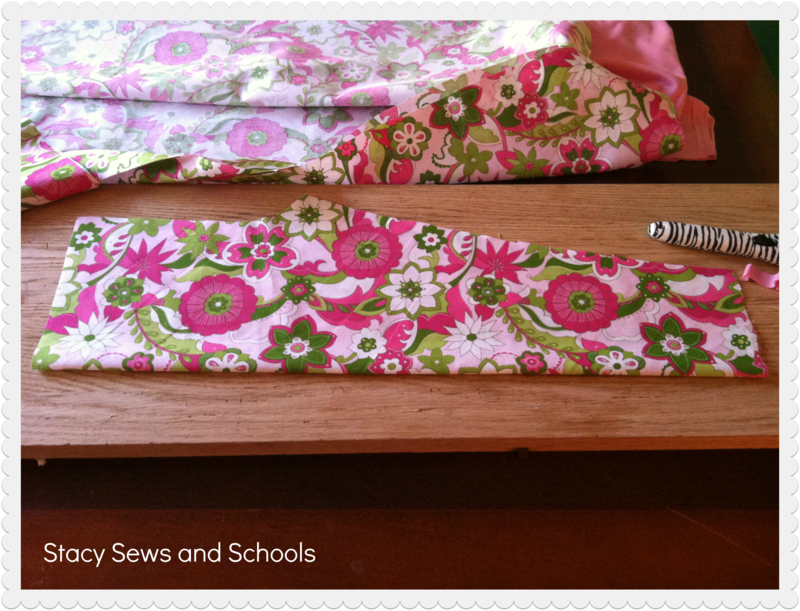 Pin it up and sew the seam in one continuous stream. Make sure to reinforce the crotch! 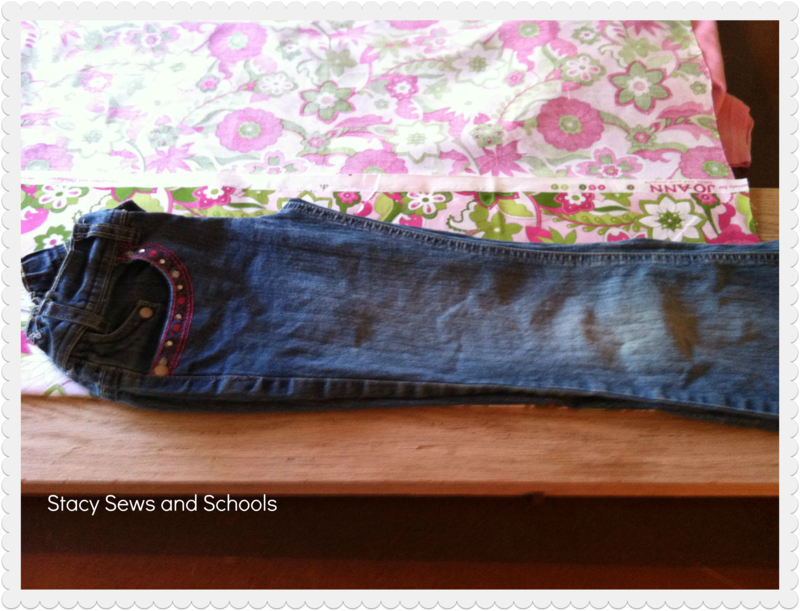 Fold over the top of the pants 3/4″ and press. 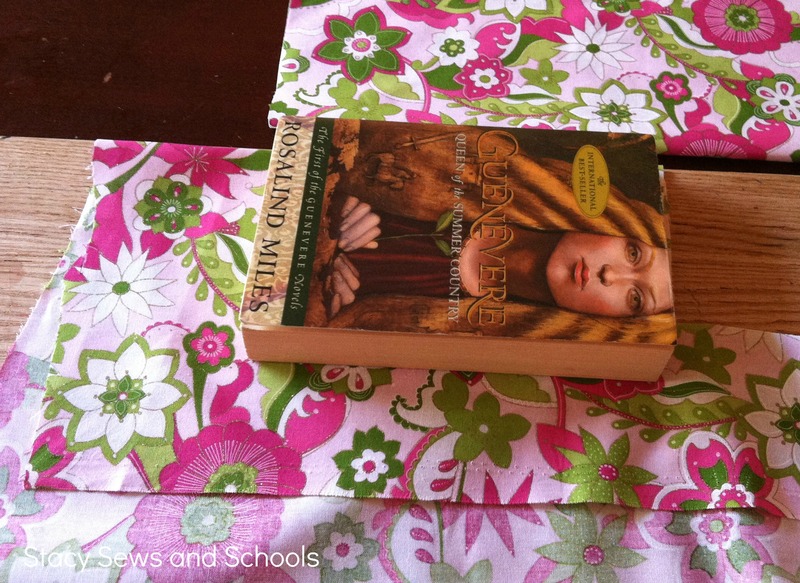 Fold over 1″ and press. 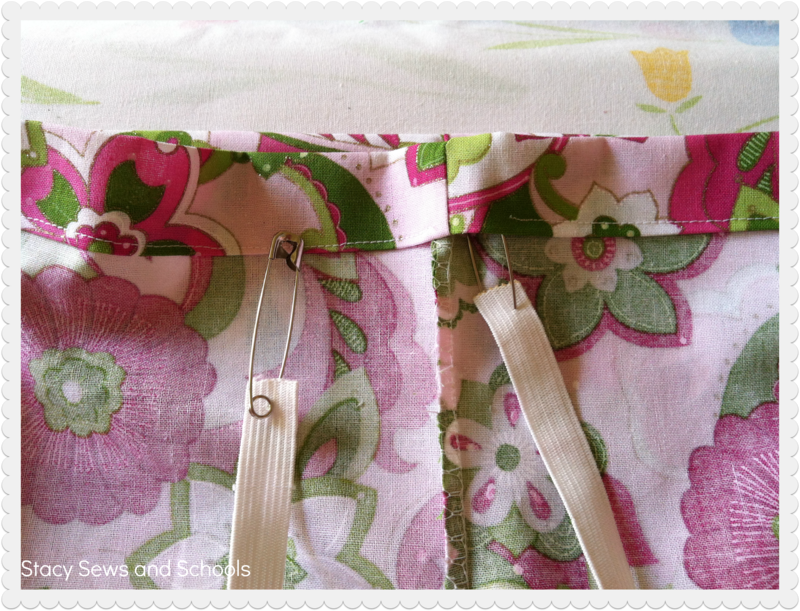 Sew the elastic casing leaving an opening to insert the elastic. 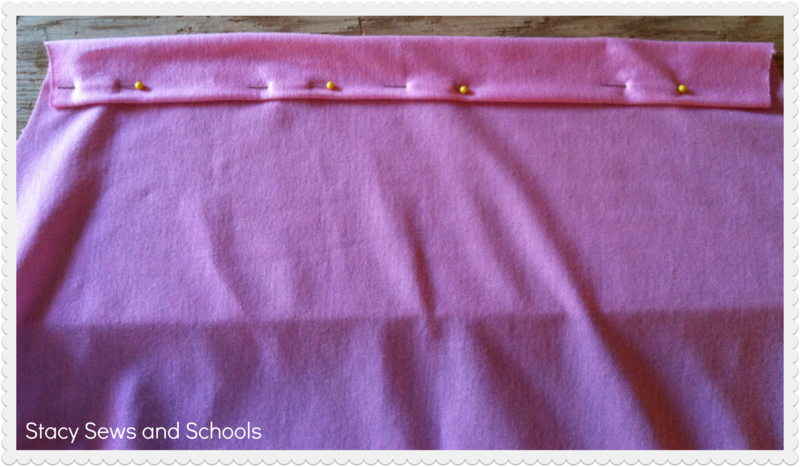 Pin the ends of the elastic and either hold tightly to both ends or pin on end to the fabric. 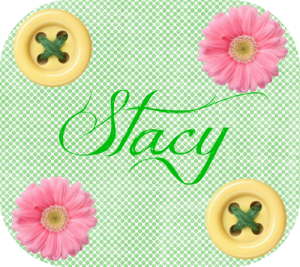 Insert the elastic through the casing! 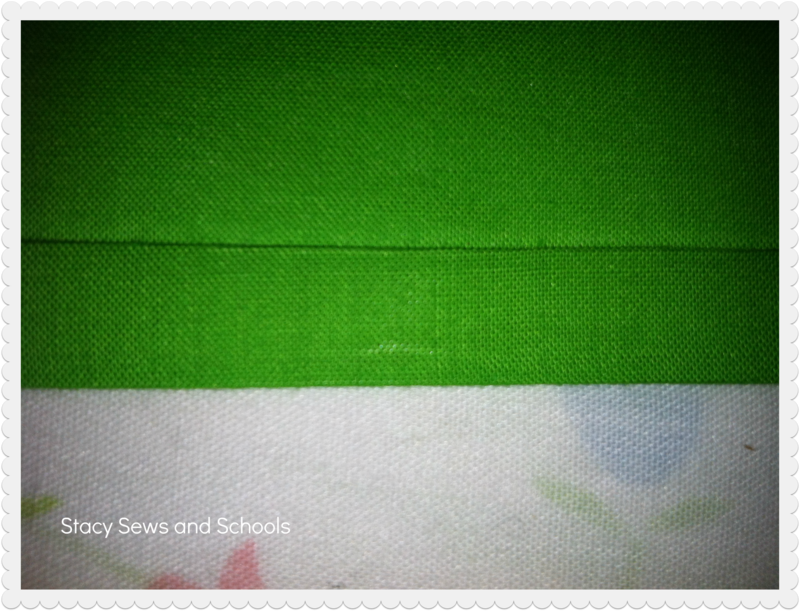 Sew the ends of the elastic together using a zigzag stitch. So, what are YOU working on?? ?